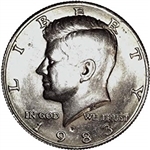 The Kennedy Half Dollar was struck in 90% silver in 1964. 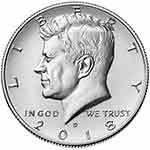 The following year, this was changed to silver-clad, with the silver content lowered to 40%. In 1971, the circulation coinage composition was changed a final time, eliminating the silver, and using the copper-nickel clad standard common to the dollar, quarter, and dime. 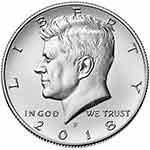 Bicentennial Kennedy Half Dollars dated 1776-1976 were produced in the years 1975 and 1976 in the copper-nickel clad composition for circulation and proof and also in the 40% silver composition in uncirculated and proof versions for inclusion in special collector sets. The Kennedy Half Dollar began production in 1964 after the death of President Kennedy. 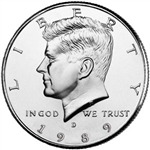 The 1964 Half Dollar was made with 90% silver. 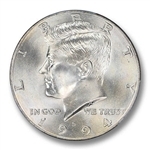 From 1965 to 1970 the silver half dollar production continued but with only a 40% silver content. From 1971 to present day the half dollar is made with a nickel/clad composition. 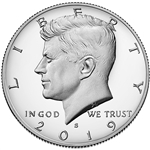 In 2002 the U.S. Mint ceased production of the Kennedy Half Dollar for commerce use and started minting enough coins for collector demand only. The mintage levels dramatically dropped off as less than two million coins per year from each mint were made.